Wrong school is not always the low ranked, it could be a higher ranked one but one that doesn’t offer you right resources for your areas of interest. It happens when applicants do not do proper school research, go by the advice of counselors who just want to get you an admit anyhow and suggest uber-safe but horrible schools, rely too much on the ranking alone, want to save money by applying to low tuition schools etc. It also happens when applicants are not clear on what they are looking for. Knowing what you want to do after Master’s is crucial to choosing right schools. A very good PhD applicant applied to Columbia EE program and got into it. This was the only admit but they did not offer any form of aid. It was not possible for this candidate to attend Columbia with a $100K loan. This situation could have been saved if he had found out earlier that Columbia offers scholarships rarely. There are some CS schools which rarely take students from non-CS background. If you are ECE student applying to CS in such a school, then it is simply a foolish choice. Many very good profile candidates decide very late that they should apply. If you apply after 15th Jan, I feel that your admit as well as aid chances start going down significantly. Simply because seats are getting filled already and competition for remaining seats goes up. That is why we suggest a Fall timeline wherein you finish applications by end of Dec max. Lack of awareness and targeting too many things (applying for MS, MBA, taking CAT, GATE at the same time). Spending too much time by yourself hoping you can do it all on your own while being in a demanding job. SOP is not a formality. It is a critical piece of your application. Applications are a sales pitch telling the AdCom what they are looking for about you. ‘Why should they admit you’ should be clearly conveyed. Same as above – it happens when people are running late and are too busy or just take the whole process very lightly. The fact is admissions in US/Europe/Canada work very differently from that in India. As a result, Indians underestimate how much time it will take to prepare a good application. 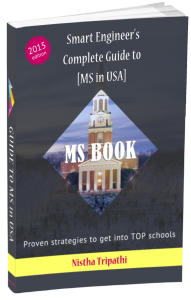 I have seen that a good MS application can take 1-2 months for SOP/LOR prep and a solid MBA application needs around 3 months to get done all the essays. Another cause is overconfidence. I have seen many people with good GPA and GRE scores thinking that they can easily get anywhere. They do not pay attention to what they are writing in SOP and essays and there are cases when 330+/780+ scores are not able to make it to Top 20 schools. Admission Committee is looking for technical expertise other than scores. And they are looking for someone with clear goals. They are looking for a winner who will take the name of their school to new heights. And a high GRE/GMAT and GPA score alone does not convince them. Story matters even more when you are switching your streams (e.g. ECE student applying to MS in CS, IT to Banking in MBA). You need to very carefully demonstrate your fit in these cases. By wrong, we mean the counselors whose commercial interests are not aligned with your career interests. Those whose metric of success stem from how many admits they got you instead of thinking of your wellbeing. Those who are number driven and willing to take anyone and everyone. Counselors who may suggest schools which are not worth going to (no career prospects or not recognized enough). While one doesn’t need a counselor, a right counselor at right time can really be the difference between a Top 30 and Top 10 school. If you feel you are not able to find enough time, it is better to take counseling help and save time. The problem happens when people go for big names and those who offer cheaper counseling (compensating by taking a lot of students and not giving enough time to anyone). The problem is that these counselors might suggest you safe but unworthy schools because they want to show they have gotten so many admits. They have tieups with shady schools which do not even require GRE. Whenever you hear this, run in another direction. Many of these counselors claim to write SOP for you. Yes, when you hear this, again run. And don’t look back. What you need to ask any counselor is – who is exactly advising you and does he have background in your field? Has he gone through MS/MBA application process himself? Will he be reviewing your essays personally and on what points? How much time will he be devoting to you? Have they helped get students with your profile in the past? What exactly were the results? I have heard from 2 students in this season already who went for other counselors in Delhi and Mumbai and had very bad experience. Every year, I get enrollments from people who have already wasted time with unreliable counselors. First of all, if you start 6-8 months in advance of the deadlines, you can find all the information on the Internet and do NOT really need a counselor. A good counselor will not spoonfeed or write for you, he will guide you in the right direction and keep you on track. He will tell you honestly your chances in good schools and make you work hard to get there. If I am the AdCom and I am seeing a GPA which seems low for your background, then I will question your ability to handle the coursework in Graduate School. It is your responsibility to tell me why that low GPA does not represent your true capability. If you ignore that or choose not to say anything about it, I would assume that there is no good reason for it and you may face problem in handling the coursework. This is one example of why you must think about what are the shortcomings in your profile and how to address those. Since 2014, we are helping Asian applicants crack topmost schools in USA. If you wish to work with us, join our counseling.